The Buyer: Mr. Alex MacGillivray is a senior executive with broad expertise in the financial services industry. Mr. MacGillivray has a track record of success in achieving multibillion dollar sales revenue and bottom line profitability. Mr. Jay Preister, a relative of Mr. MacGillivray’s, was also working in the financial services industry. The two formed a partnership for the purpose of acquiring a small privately held company together. 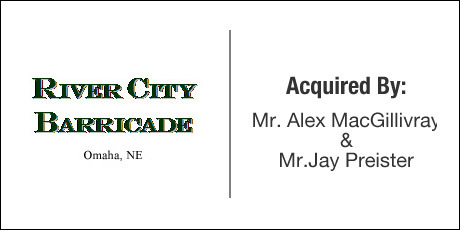 The Seller: River City Barricade is a 25 year old regional company that offers barricades sales, rental, and service to the city of Omaha, NE. and surrounding municipalities. The Close: Using their proprietary deal sourcing expertise, DVS found a number of opportunities for the buyers to consider, including River City Barricade. The business was not yet listed for sale but the owner was in the process of getting a certified valuation and preparing to take the business to market. The timing was perfect for DVS to negotiate on behalf of their clients in a non-competitive environment and structure a deal that was fair and equitable to both parties.